There are a few dinners I remember from my childhood that stand out as special. Spaghetti and Meatballs is one of them. I’ve always considered it the quintessential Italian meal. The best thing about spaghetti, besides the fun of eating it, is the joy of sharing this communal meal with friends and family. Just like my childhood memories, spaghetti and meatballs equals love in our house. It’s comfort food that somehow remains unchanged from generation to generation. Nicky loves it as much as Benny, and I love to watch them eat it…twirling their spaghetti into a spoon, marinara dripping down their chins. Growing up, simple food and good friends were always most important at our dinner table. This continues to be our recipe for happiness. One day Benny and Nicky will look back at their family dinners with fondness, just as I do. So this one’s for you, mom. Thank you for a life of family dinners that I’ll always remember. Thank you for setting an example I will forever follow. My family taught me that every meal should be a celebration. That’s amore! Taking a few shortcuts, like buying your own sauce and cooking the meatballs in the simmering sauce, will help you get dinner on the table fast and the enjoy the family more. Place the sauce in a large saucepan and bring to a simmer. In a large bowl, gently combine beef, onion, bread crumbs, cheese, egg, parsley, salt and pepper, and shape into 1 ½-inch meatballs. Place the meatballs in the simmering sauce, cover and cook, turning meatballs over once, for about 20 minutes or until cooked through. Ladle meatballs and sauce over warm spaghetti. Sprinkle with additional grated Parmigiano-Reggiano and fresh basil (the more the merrier). AAAhhh - that's so sweet. Well, make me all weepy at 6:30 in the morning. Love you! What a wonderful way to honor your very dear mother. And don't all children look the same eating spaghetti? Lots of hugs all around. Love it! 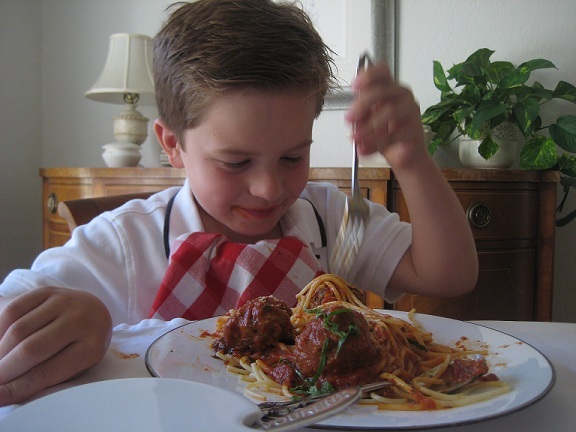 Almost everyone has a great childhood memory of eating spaghetti, don't they? Thanks Jean! Yes, you're right...even babies in highchairs. I don't remember Mam-maw cooking spaghetti. She burned me out on hamburger patties for Pap-Paw! But I still love spagetti and meatballs. Thanks Tony, how wonderful! Great tip on the Italian sausage. Thanks Tam. So thrilled you're following Special Fork! That's funny Lynise. What a great memory! i love your story aunt meme!!!! and today nana made some spaghetti!